TomTom PRO 5150 TRUCK LIVE sat nav has been designed specifically for use in a truck. It will avoid low bridges and narrow roads based upon the dimensions and weight of your vehicle. Plus it's Bluetooth compatible for making and receiving handsfree calls. It also can be dual mounted either on the windscreen or dashboard. Featuring a large 5-inch touchscreen display the PRO 5150 includes road maps for 45 European countries and truck data attributes for 27 European countries. Buy the TomTom PRO 5150 Truck Live from ActiveGPS and get 1 years FREE subscription to TomTom LIVE services and FREE lifetime maps updates. Subsequent subscription charges apply. TomTom PRO 5150 TRUCK LIVE has been discontinued. TomTom PRO 5150 Truck Live sat nav has been designed for use in trucks, lorries and HGV's. This top-of-the-range TomTom trucking system allows you to enter your vehicles length, width, height and weight into the device. Once entered the unit will then calculate your journey taking into account low bridges, narrow roads, sharp bends, etc. As well as trucks the 5-inch touchscreen TomTom PRO 5150 system can be used in multiple vehicles with different profiles and sizes - anything from juggernaut to a car. Preloaded to the TomTom 5150 are maps for 45 European countries and within the mapping, truck data is available for 27 European countries including France, Germany, Ireland, Spain and United Kingdom to name but a few (see truck attribute coverage below for full list). The PRO 5150 sat nav is a 'LIVE' product, very much like a mobile phone. The 5150 is continuously connected to TomTom LIVE services thanks to a built-in GSM modem providing you with traffic updates, Road Angel speed cameras and weather forecasts all of which are in real-time as your drive! The TomTom 5150 includes free lifetime maps (you are limited to 4 mapping updates each year). This ensures you always have the latest maps, points of interest and addresses during the lifetime of the TomTom 5150. TomTom PRO 5150 also features Lane Guidance which will help you at each junction advising you in advance which lane you should be in. It also knows the speed limit so it can alert you when you are speeding. This TomTom 5150 is Bluetooth compatible. Using the 5150‘s built-in microphone you can take handsfree calls. Plus simply dial into the sat nav touch screen a telephone number and speak with friends and colleagues whilst you are driving safely. WEBFLEET is a service available via subscription which can further enhance not only the features but your day-to-day use of the PRO 5150. Once subscribed WEBFLEET helps you save fuel with Active Drive and reduce paperwork by sending jobs straight to the TomTom PRO 5150. You can also use the software to display how many hours you've spent driving and monitor and track your performance. TomTom PRO 5150 TRUCK LIVE receives real-time fixed and mobile speed camera locations. The speed trap database includes Gatso, Truvelo, SPECS average speed cameras, mobile sites among many others. TomTom PRO 5150 TRUCK LIVE provides a dual mounting system, simply choose from either windscreen or dashboard mounting (straight from the box) with the included adhesive disk. Power the PRO 5150 using the (included) USB car charger or run it cable free for up to 2 hours via the built-in battery. TomTom PRO 5150 TRUCK LIVE sat nav is preloaded with maps for 45 countries. N.B. these maps are broken down into three different classes: detailed, partial and connecting roads. Andorra, Austria, Belgium, Czech Republic, Denmark,	Estonia, Finland, France, Germany, Gibraltar, Greece, Hungary, Ireland, Italy, Liechtenstein, Lithuania, Luxemburg, Malta, Monaco, the Netherlands, Norway, Poland, Portugal, San Marino, Slovakia, Slovenia, Spain (incl. Canary Islands), Sweden, Switzerland, Vatican City, United Kingdom (incl. Channel Islands). Bulgaria, Croatia, Latvia, Romania, Turkey, Ukraine, Russian Federation. Albania, Belarus, Bosnia-Herzegovina, Macedonia, Moldavia, Montenegro, Serbia. Andorra, Austria, Belgium, Czech Republic, Denmark, Finland, France, Germany, Gibraltar, Greece, Hungary, Ireland, Italy, Liechtenstein, Luxemburg, Malta, Monaco, The Netherlands, Norway, Portugal, San Marino, Slovakia, Spain, Switzerland, Turkey, United Kingdom, Vatican City. N.B. You will need a PC with Internet connection to register before first use. Subsequent subscription charges apply, currently (Dec 2012) 1 years subscription is £28.50, was £47.50. 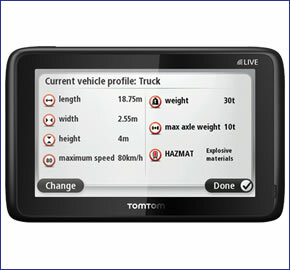 Looking for genuine accessories and spares for the TomTom PRO 5150 TRUCK LIVE? All parts are genuine TomTom product and specifically designed for use with the PRO 5150 truck sat nav.